Many people own both debit and credit cards nowadays. But how do you know when best to use one and not the other? And what exactly is the difference between the two, anyway? A debit card is a payment card that deducts money directly from your transaction account (also known as a current or checking account) to pay for a purchase. In theory, it removes the need for you to carry cash or a chequebook. A debit card also allows you to withdraw money from your transaction account through an automated teller machine. A credit card, on the other hand, is a credit facility which allows you to buy things immediately, up to a pre-arranged limit, which you then pay for at a later date. It is not linked to your transaction account. Both debit and credit cards have different advantages in different spending situations. If you are trying to maintain a good credit score, then paying with a credit card will help. The more you use your credit card while paying off its balance punctually each month, the healthier your credit report is going to be. If you need to track your expenses, paying with a debit card is useful. Since it is linked to your transaction account, where full details of all transactions are logged, you can always check your payment history via postal statements or an online tool. Debit cards are also a great convenience when it comes to recurring bill payments such as phone bills, utility bills, the monthly rent, etc. You can set up automatic payments which are taken directly from your transaction account. Just make sure there is enough money in the account to cover these payments when they are due! 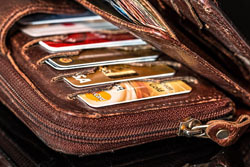 There are certain situations when it is both wiser and safer to use a credit card. These include car rentals, booking travel, vacation costs, making deposits on purchases, medical bills and large purchases. In all of these, a credit card offers more security and protection than a debit card. Credit cards often also include insurance and concierge services, and the chance to earn points or rewards. In addition, replacing a stolen credit card on vacation is easier than replacing a debit card, and no funds need come out of your account. If possible, do NOT use your debit card for online purchases. Since your debit card is linked directly to your bank account, entering your bank account information online increases your risk of identity or account theft. The recent spate of hacked user information from companies such as Target, EBay, Sony and TalkTalk is a grim reminder to keep your digital security tight at all times.